How will your life and business be impacted by A.I., Virtual Reality, Robotics, 3D Printing, Drone Technology, BlockChain, and Crowdsourcing? Today’s episode is about today, tomorrow, and the future… and the Future is closer than you think! And what this means for you is that if you are positioned properly and prepared to implement these tools, you’ll be poised ahead of your competition (and not be left behind). 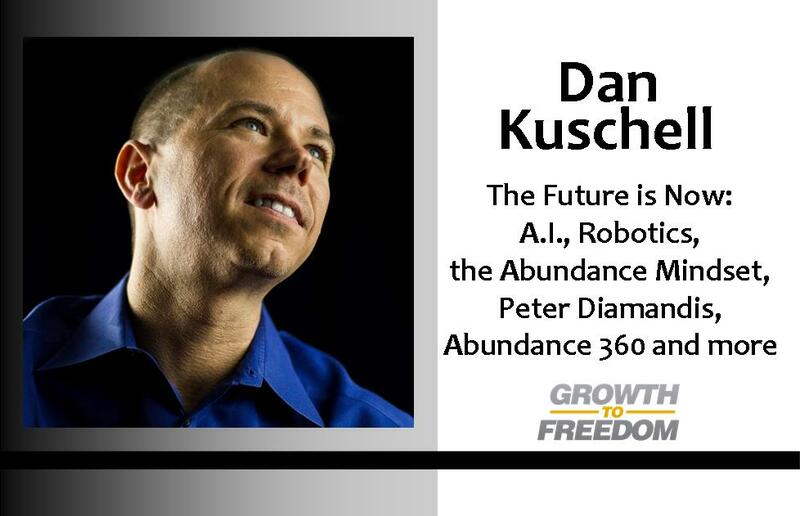 Having spent 4 days at “Abundance 360,” (hosted by futurist, Genius Network Member, and co-founder of XPrize and Singularity University, Peter Diamandis) it was inspirational and certainly opened up my eyes to all kinds of opportunities for the future… It was a cross between Star Trek, Back to the Future, and I-Robot (the movie)…. Mindset: We talk a lot about the importance of mindset on the Growth to Freedom show, and in particular how to develop an “abundance mindset.” If you’re going to make the most of the powerful changes in technology, you’ve got to be able to foster and feed an abundant mindset. Exponential technology: Embracing the changes that are coming to the tech space can enable you to be on the cutting edge of the changes that impact your industry and your life. You’ve got to learn to think beyond what’s possible today to see what might be possible in the very near future so that you can position your business for its greatest success. The crowd: Many companies are already tapping into the resources of the crowd, other people who have ideas, skills, and expertise that helps them move their business and ideas forward. How are you going to act when it comes to accessing the wisdom and insights of the crowd? Experimentation: What are you willing to fail at in order to develop and grow? Larry Page of Google is well known for saying that he counts the number of experiments and failures they’ve iterated as part of the success of Google, and you can see the benefits of doing so. What role does experimentation need to play in your product development, marketing efforts, and advances in your field of expertise. The wave is not coming. The future is now! [1:54] The future is closer than you think. [3:17] How to tap into opportunities with 3D printing. [4:19] Leadership: Extending the conversation about advancing technologies. [8:24] What can happen as your mindset leans toward abundance. [9:45] The cost of NOT having an abundance mindset. [10:00] What are you willing to fail at for the sake of growth? [13:09] What is the correlation between mindset and technology? [15:57] How experimentation fits into your life and business growth. [19:10] How to stimulate your thinking to get your ideas moving toward reality.